The city of Łódź, in the heart of Poland, has set itself the objective of revitalising and beautifying the city centre. As part of this endeavour, a new train station was constructed that will serve approximately 200,000 passengers daily, increasing by 20 times its previous capacity. This makes it the largest project of its kind in the country. All of the buildings in the adjacent streets had to be demolished, and almost 700,000 m³ of concrete was used for the structure. The train station was designed to connect with the subterranean tunnel stemming from the Łódź Kaliska Station. 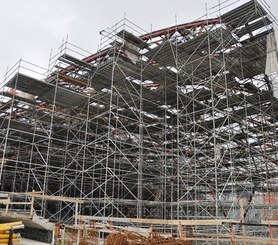 ULMA provisioned almost 200,000 m³ of BRIO Multidirectional Scaffolding to shore the three steel structures supporting the skylights that form roofs A, B, and C, measuring 80 m x 95 m, 40 m x 110 m, and 40 m x 125 m respectively. An assembly of MK Walers and EP Props was installed on top of the scaffolding to brace the metal roof structure. 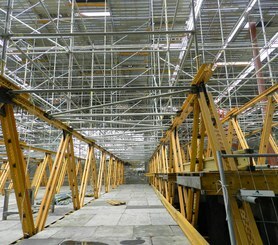 The Brio Scaffolding structure, with modules measuring 3 m x 3 m x 3m, was set on MK Trusses 2.8 m high and 24 m long. 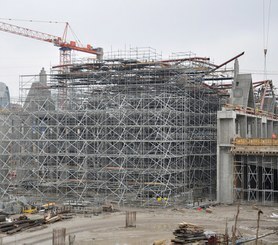 The truss nodes were aligned to coincide with the scaffolding support points. 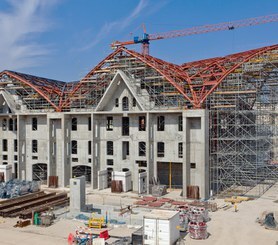 Twenty-four such trusses were employed throughout the project. In order to level the assembly, MK Base Screw Jacks with 360 kN load-bearing capacity were used. The scaffolding was adjusted to meet the different requirements occasioned by the varied skylight inclinations and forces exerted on the support points.